What you get for RM14++: Fragrant rice, Delicious curry chicken, Half boiled egg, Sweet and spicy sambal ikan bilis, Yummy achar and Chicken floss. Man, was it a heavy meal. 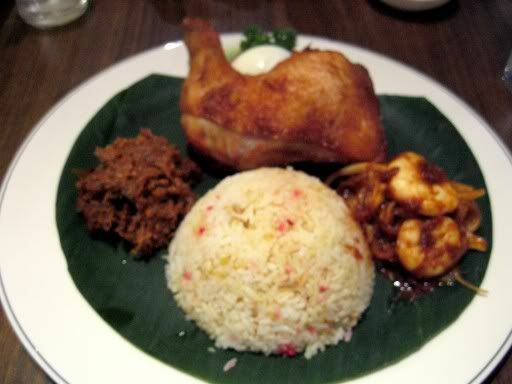 What you get for RM19++: Fragrant rice - coloured and fried with bits of chicken, garlic and dried prawns, Tender beef/ chicken rendang (your choice), Chicken drumstick fried to crispy golden brown perfection and Assam prawns. I didn't have any dessert that day as stomach was already bulging but I've tried the banana split and sago gula melaka on prior occasions - they are refreshing but nothing extraordinary. Truth be told, the prices here are NOT cheap but it's for a reason - you are paying a premium to eat at a nicely decorated, air conditioned eatery and be served by friendly, helpful staff with super quick order to serving time. I will say though, the food quality is consistent and the servings are pretty generous so you won't feel cheated. 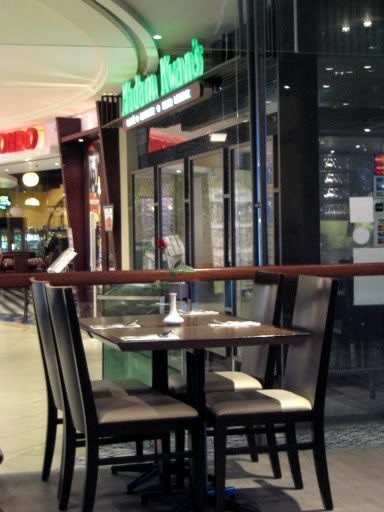 Hey, we also ate at Mdm Kwans recently but in a huge group. 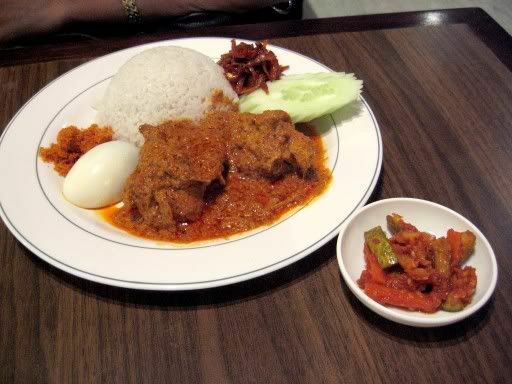 Found out it's cheaper to order the same items from the menu to share that resemble Nasi Lemak and Nasi Bojari i.e. assam prawns, rendang, chicken curry, fried chicken. You can change yr normal rice to coconut rice or Bojari Rice too. 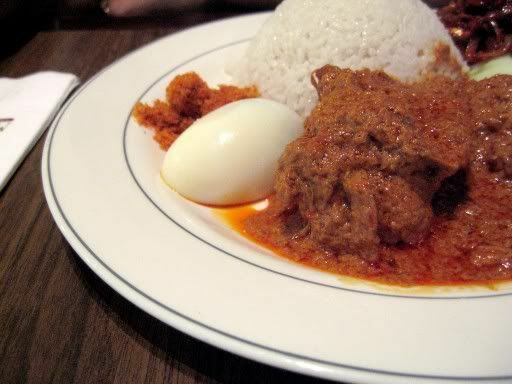 I heard that Mdm Kwan's are famous for their nasi bojari. The picture looked delicious. ;) Haven't try out their food yet though. :) Yeah, my friend said their food was expensive. j, did you find their service at this outlet superbly fast? Da last time I went there, it took them less than 5 minutes to serve da drinks and food! Amazing!!! Well,.. it's definately worth a try! Yeah - amazing isn't it? Seems like that's the general consensus. It's wonderful that they have maintained that quality all this time, don't you think so? Hello. This is Leonard Lock here. It seems that u know me. Btw, I have to show u some shots i took from Madam Kwan's at Mid Valley. Is there anyway we could get in touch (since u r onli know as J). Oh man... I knew you liked Starbucks but blogging about it brings it to a totally new level! Come to KL and eat it! Oh.. it used to be RM17? Hey - thanks for pointing that out! 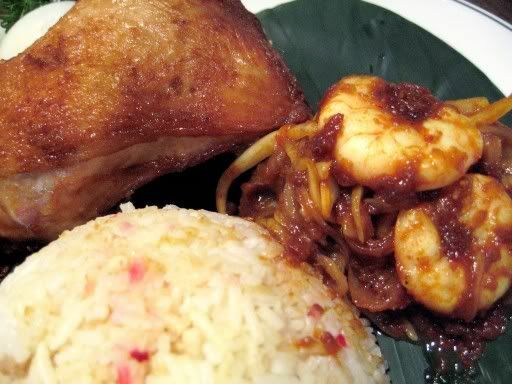 hei....try madam kwan's asam fish head for ur nxt visit...errr...quite a BIG portion but i think it tastes great wiv steaming hot rice! I am so boring though - because I don't go there often, I always end up ordering the exact same dishes, either the Nasi Lemak or the Nasi Bojari. i m a regular customer of mdm kwan's restaurant...especially i like the curry fish head, nasi bojari and oso dessert is cendol...hahah...of course once i order curry fish head is with my family, sure with a group la.anyhow, i like the service there, their noted me and my family and always with Mr. so and so to calling us, Good!! bxmlhogqqvvrcvekt, nail fungus treatment, hQUCdMs?